I was the first one at school again. I proudly showed my teacher the sentences I had written and she was amazed that I was able to actually use that Spanish dictionary and that it was working for me. “Yes I did, I was worried that if I stopped I might forget what I had learned so far,” I replied. She gave me a few extra work books to take home to read and write in. I started reading one paragraph at a time. I was able to sound out most of the smaller words but I was having a hard time comprehending what I was reading. I had a really hard time concentrating and it would always end in a headache. Before I knew it, it was Friday. I had been going to school for four days. I was getting low on food so I fired up Izaak’s car and drove to the food bank. I walked over to George’s and knocked on his door. He opened it with a big smile. As usual, he was wearing nothing but a pair of ripped and torn jeans and his tattoos. He was completely covered in saw dust. “Hey girl, what’s up? What’s happening, how are you?” he asked. “Oh Anna, you don’t have a learning disability, you should drop that word completely,” he said. “Do you really think so?” I asked. “Absolutely. I don’t think so, I know so,” he said. “Okay, I’ll work on that. Could you do me a favour? Could I borrow your perfect handwriting to write a thank-you note in this card for the nurse?” I asked him. “Ahhh, I don’t know about perfect, but okay sure. I’ll write anything you want. Just let me clean up first,” he said, and went to his bedroom. He came out dressed in clean clothes. As he pulled his fingers through his hair he sat down beside me on the floor by the coffee table. “What are you making?” I asked. I told him what to write and he started writing. When he turned to hand the card to me I quickly looked to the lizard and pretended I had been looking at it the whole time instead. The lizard tilted its head at me and blinked. “Are you going to bring it to her now?” he asked. “No, there isn’t anything like that in this town. Unless we go to London?” he said. “Actually I have been craving one of those spicy chicken burgers from Wendy’s I had a long time ago. Do you like Wendy’s?” I asked him. “I’m not picky at all, I will go anywhere you drive to,” he replied. “Okay, Wendy’s it is, then,” I said. We drove to Wendy’s, ordered the spicy chicken burgers and went outside to sit at a picnic table. I was just going to take my first bite and there were the Brauns again. Mr. Braun sat down at the picnic table right next to us and lit a smoke as Mrs. Braun walked in with all the kids. Mrs. Braun looked like she was about nine months pregnant, carrying a toddler, as she brought all the food out to Mr. Braun. She looked exhausted and sad as she served food to her husband, all the kids, then feeding the toddler. George turned to me with a smiled and winked at me as he continued eating. I blushed and felt a warm sensation that went all the way down to my toes. From being nervous that the Brauns were staring at us and the warm feelings I felt from George’s wink, I just couldn’t eat any more. “Sure, let’s go,” I replied. When I got home I had a message from the nurse at the walk-in clinic. Hearing her voice made me feel so good until I thought of my mom calling and asking me what I was still doing hanging out with a ‘sween-nagel’ again. I turned on the TV for background noise and started working on my homework. Saturday morning I went downstairs to pick up some local newspapers. I cut out a bunch of articles and practiced finding the five w’s so that by Monday I would be faster at it. I spent that whole weekend inside and reading like the teacher showed me. I stopped worrying about the words I couldn’t pronounce. I just skipped them and continued. I didn’t comprehend much but I kept at it all weekend. I never went outside because I didn’t want to risk running into Mark again. I just didn’t have the right words for him. Monday morning I woke up early with my usual knot in my stomach relieved, but sad that my mom hadn’t called. I sat up and said my morning prayer. I missed my family so much I thought of ways I could feel closer to them and make Mondays better. The only thing I could come up with was to have a shower and put on one of my favorite brown pleated dresses with yellow tulips that I had brought from Mexico. 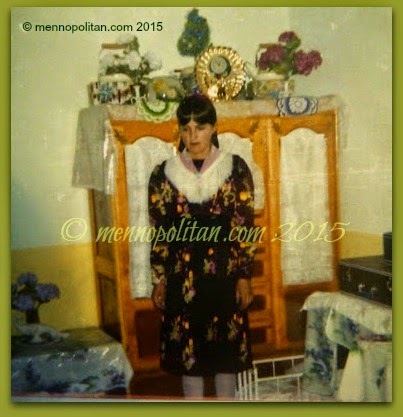 That was the last dress my mom had made for me. Most people in my class knew I was Mexican Mennonite. And it didn’t really matter how I dressed anymore. Some days I felt more comfortable dressing the way I had been dressing for the last nineteen years. I rolled my hair into a side bun like my teacher had the first day I met her. I put on my best white socks with lace around the fold and my strappy sandals. I was the first one at school again. A bunch of the students were late, they had all been at a party the day before. They all looked really tired and had red eyes. One of the men walked past me and I smelled whisky on him. Smelling that next-day whisky smell on that man triggered many memories. I fought to keep my thoughts at the school all day. My thoughts just wanted to go to Mexico no matter what I did to try and stop it. Click here to continue reading my story.